This is the original Polaris Booster Pump that has been in the field for over 40 years! You can use this Booster Pump for any pressure-side cleaners. Current Polaris Pressure Side cleaners models 280, 380, 480 and 3900 Sport. The PB4-60 comes with connection hoses, is in stock and ships within 1 business day. Be sure to set your Polaris PB4-60 to run within the time your circulation pump operates. Otherwise the pump may run dry causing you to click on our parts tab above. Our crusty old technicians who answer phones here have repaired or replaced HUNDREDS, and I mean HUNDREDS of these pumps during their time in the field. If you have any questions please feel free to call us, send an email or start up a chat. QUALITY PUMP AT A GOOD PRICE. It was recommended by pool person to run our Polaris. great price, cheaper than my local supply store! It is a replacement that I need. Old pump had worn bearings and finally quit. the same as my old one. Best price for leading brand. Leaking and unit is 14+ years old. It replaces the one I currently have, which developed a crack in the housing and leaked water. It is an old pump. I need to replace my expired Polaris booster pump of the same make and model. Great price, and it matches my Polaris cleaner. To replace one that is broken. bought it before, good for about 4 seasons, doesn't seem to be any alternative with USA manufactured motor. A replacement for the original pump. Does this come with the instillation kit? BEST ANSWER: Faith, anything you need to install the pump comes in the box. I was able to install my pump in 15 minutes by mysel. I am not a mechanically inclined individual, so that really speaks to the genuine ease of installation. You will need a screwdriver and utility knife (to cut hose to appropriate length). Good luck! We've been happy with the product! The answer is "Yes" it does come with piping and couplers to hook it up. You will need to have an experienced electrician do the wiring hook up if you're not familiar with electrical connections. Doesn't take long to install. Plumbing installation yes, Electrical installation no. This is a Polaris pump isn't it? BEST ANSWER: Yes, it sure is. I replaced my old one after about 14 years of service (electrical problem). The new one has been in place for two swimming seasons and I have no problems with it. Do you have a copy of the installation drawing I can review? BEST ANSWER: It has been so long ago that I don't believe I still have the papers that came with the pump! I am traveling and I can't give you a definative answer for at least a week! I’m looking to replace aPentair Booster pump model #LA01N. Is this the pump I need? 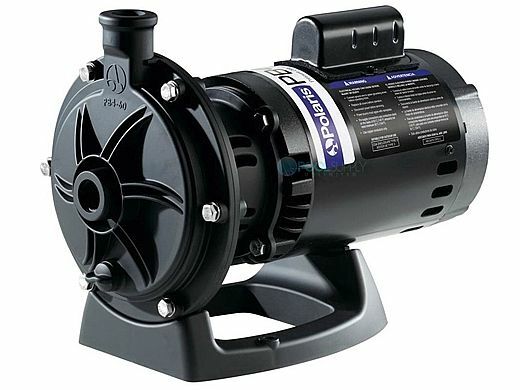 BEST ANSWER: You may replace it with this pump or the Pentair version LA01N. Purchased a replacement Polaris Booster Pump from PoolSupply Unlimited. Got a great price and shipping was quick. Everything needed for the install was there. Installation went easily (couple hours for this novice). Pump works great (hey, it's quiet too). Will be using PoolSupply Unlimited again I'm sure. Replaced the Booster pump and now all pool equipment is up to day. It is actually fairly quiet! Bought my Polaris cleaner all confident that it was all i needed until I noticed it required a booster pump. Good thing once I ordered this I got it in the mail in 3 days, very good service. Product just as advertised. Delivery prompt and on time. Works like a charm and my pool cleaner (Polaris) is finally working at its best. The booster pump works very well. I am grateful that I got it. Zodiac heat pumps are warranted for two (2) years. Heat pump compressors and heat exchangers are warranted for five (5) years. Jandy Pro Series variable-speed pumps that are professionally installed on or after October 1, 2015, will be warranted for a period of three (3) years from date of purchase. Jandy Pro Series & SAVI nicheless underwater LED lights (including LED light drivers for: bubblers, lit falls, and celestial fiber) that are professionally installed on or after August 1, 2015, will be warranted for a period of three years from date of purchase. Electronic salt water chlorine generators, including Nature2 Fusion Soft, are warranted for three (3) years, with the exception of the Zodiac AquaPure® Ei™ Series, which is warranted for one (1) year. Never Lube® valves are warranted for the life of the pool on which they were originally installed. In-floor cleaning heads are warranted for the life of the pool on which they were originally installed, if originally installed with Zodiac’s in-floor cleaning valves. In-floor cleaning hydraulic valves, UltraFlex® 2 valve housings, and leaf removal deck canisters are warranted for three (3) years. Zodiac robotic cleaners are warranted for two (2) years. Kontiki cleaners are warranted for ninety (90) days. Failure to properly install, operate or maintain the product in accordance with Zodiac’s published installation, operation and/or maintenance manuals. Use of non-factory authorized parts or accessories in conjunction with the product(s). Product modifications or adjustments that are not in accordance with Zodiac’s published installation, operation and/or maintenance manuals. Not maintaining proper pool and/or spa chemical balance [pH levels between 7.2 and 7.8, with ideal range being between 7.4 and 7.6; Total Alkalinity (TA) between 80 to 120 ppm; Total Dissolved Solids (TDS) less than 2000, not including salt ppm]. Corrosion, erosion, scaling, calcification or other conditions caused by water hardness, chemical imbalance, or lack of product maintenance. Chemical contamination of combustion air; or improper use of pool/spa chemicals, such as introducing chemicals upstream of the heater or cleaner hose, or through the skimmer; or use of copper-based algaecides in conjunction with Nature2 products. Abuse, damage during transit or installation, mis-handling, tampering, vandalism, alterations, accidents, fires, floods, storms, earthquakes, power surges, lightning, pets or other animals, insects and/or their hives or nests, negligence, or acts of God. Not grounding and/or bonding as specified, mis-wiring, loose wiring, cut or kinked wires, loose cable connections, incorrect wire runs, incorrect breaker size, breaker(s) in “off” position, improper wire gauge, moisture in electrical conduit, improper electrical supply, dead batteries, incorrect plumbing, inadequate size of pipe and/or fittings, cross-threading, over-tightening, under-tightening, glue drips or residue, improperly secured covers, improper valve placement or usage, unsynchronized valve actuators, valve actuators in “off” position, improper gas pipe sizing, lack of fuel, inadequate heater vent pipe sizing, programming errors, or removal of in-line filter screens from pool cleaners. Freezing, corrosion, cracking, overheating, warping, flooding, moisture intrusion or any other condition caused by or related to weather, climate, improper winterization, improper equipment placement, inadequate ventilation, inadequate water circulation, roof run-off, sprinklers, irrigation systems, or lights or other products on or near the pool/spa or pool/spa equipment pad. Operating the product at water flow rates below minimum, or above maximum, specifications. Operating any product or piece of equipment including, but not limited to, pumps, with insufficient quantities of water. Improper equipment sizing, or product mis-applications including, but not limited to, unsuitable application of a pool cleaner, or use of residential products on commercial applications. Dirty, clogged, blocked, covered or obstructed plumbing, cleaner parts, chlorine generator cells or sensors, pump strainer baskets, pump impellers, heater orifices (including blockage by spider webs), heater grills, doors, flue boxes, flue vents or flue collectors, filter elements, or filter breather tubes. This is the only warranty given by Zodiac. No one is authorized to make any other warranties on behalf of Zodiac. IMPLIED WARRANTIES, INCLUDING THE IMPLIED WARRANTY OF MERCHANTABILITY AND THE IMPLIED WARRANTY OF FITNESS FOR A PARTICULAR PURPOSE, ARE LIMITED TO THE EXPRESS WARRANTIES LISTED ABOVE. Some states and/or provinces do not allow limitations on how long an implied warranty lasts, so the above limitation may not apply to you. Zodiac expressly disclaims and excludes any liability for consequential, incidental, indirect, or punitive damages for breach of any expressed or implied warranty. In no event shall Zodiac be liable for incidental or consequential damages of any nature, including damage to vinyl liners, plaster, aggregate-based pool surfaces, tile, stone, coping, fixtures, skimmers or skimmer covers, plumbing, drains, equipment covers or shelters, landscaping, animals, plants, or dwellings. Some states and/or provinces do not allow the exclusion or limitation of incidental or consequential damages, so the above limitation may not apply to you. Certain vinyl liner patterns are particularly susceptible to rapid surface wear or pattern removal caused by objects coming into contact with the vinyl surface, including pool brushes, pool toys, floats, fountains, chlorine dispensers, and automatic pool cleaners. Some vinyl liner patterns can be seriously scratched or abraded by rubbing the surface with a pool brush. Ink from the pattern can also rub off during the installation process or when it comes into contact with objects in the pool. Zodiac is not responsible for, and this warranty does not cover, pattern removal, cuts, abrasions or markings on vinyl liners. This warranty gives you specific legal rights. You may also have other rights that vary by state and/or province. For warranty consideration, contact the original dealer and provide the following information: proof of purchase, model number, serial number, date of retail purchase, and date of installation. The dealer will contact the factory to obtain instructions regarding the claim and to determine the location of the nearest independent service company. If the dealer is not available, you can locate an independent service company in your area by visiting www.zodiacpoolsystems.com or www.polarispool.com, or by emailing our Technical Support Department at productsupport@zodiac.com, or by calling our Technical Support Department at 800-822-7933. In Canada, visit www.zodiacpoolsystems.ca or www.polarispool.ca or call 888-647-4004, or email the Technical Support Department at customerservicePSC@zodiac.com. All returned parts must have a Returned Material Authorization number to be evaluated under the terms of this warranty.